Are you getting ready to walk down the aisle soon? Do you want a venue that is as special as the occasion? 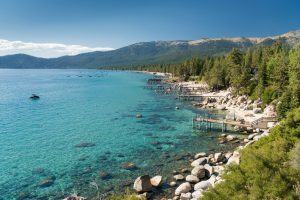 Why not plan a wedding in Lake Tahoe? Nestled in the heart of the Sierra Nevada Mountains, this picturesque wedding destination attracts couples from all over the world who want to make sure that they have the most beautiful and unforgettable wedding. Lake Tahoe weddings are perfect for brides and grooms who want to make sure that their special day is romantic with nature’s beauty all around. Lake Tahoe is the ideal location for a wedding as it is beautiful throughout the year. No matter what season you pick for your wedding, you can be sure that you will have the most amazing backdrop for your special day. There are also multiple locales you can choose from to exchange vows. You can choose from Tahoe lakeside weddings, mountain top weddings, beach weddings, and more. Whatever your vision is for this important day, you can make it come true in this picturesque part of Northern California. When it comes to planning weddings, there are countless details to take care of. The whole experience can be stressful and overwhelming. So why not let the professionals handle the task? We can take care of your needs and make sure that you have the perfect Tahoe wedding. Whether you want a grand event straight out of a fairy tale or a simple, intimate ceremony with a few loved ones, we will make sure that your dream wedding becomes a reality. We understand that your wedding is the most important occasion of your life and that you want everything to go off smoothly and perfectly. Apart from the ceremony, reception, cake, photographer, etc., you also have to think about accommodations for your guests. We will handle every detail, big and small, and give you the best wedding anyone has been to. From small Lake Tahoe weddings to lavish events, we have done them all and know just what you need to have an unforgettable wedding. Whether you want an Emerald Bay wedding or a ceremony on a mountaintop, we are the wedding planners who will make sure that you have it. We will pull out all the stops to create a wedding that is not only beautiful and romantic, but truly memorable for you and your family and friends. We will give you the perfect start to your new life as a couple.